If only the creature in The Giant Claw was the one advertised on the poster. The other day on Facebook someone put up a picture that brought back interesting memories. The picture was a still from The Giant Claw. I remember the events leading up to my seeing this film. I don’t remember the exact year. I know it was the summer of 1964 or 1965. My family was vacationing at the military park on Lake Texoma. We were visiting with my uncle Johnny and his family in the evenings and spending the day swimming at the lake. I am not a great swimmer and this may have been a reason why. About ten in the morning, we were wading around in the water when my sister screamed bloody murder. She had stepped on a broken beer bottle and gashed open the sole of her foot. My mom grabbed a towel and wrapped up the foot. We got our stuff together and made the drive over to Perrin Field and the hospital. About an hour and a couple of stitches later, she was better. We went back to the lake and had our lunch. In the afternoon, we went back into the lake (except my sister, who had a bandage on her foot). About 2 p.m. my brother stepped on a broken beer bottle and sliced open the bottom of his foot. Again, we grabbed up our stuff and headed back to town. I got dropped off at my uncle’s house, as sitting in the emergency room for the second time that day did not appeal to me. My cousin Ronnie was there. We were about the same age but of totally different temperaments. While the family was at the hospital, Ronnie and I watched The Giant Claw. The family came back for me after about an hour and a half later and asked if I wanted to go back to the lake. I looked at my pale, flat and unscarred feet and said I thought I would stay at the house and finish the movie. If you’ve ever seen The Giant Claw, you know what a hard choice that was. Aeronautic Engineer Mitch McAfee (Jeff Morrow) is performing some tests in a jet when he witnesses a large shape coming toward his jet. He cannot make out the details but it is big and moving very rapidly. He narrowly avoids a collision and returns to the ground. Here, as he recounts his encounter, he is greeted with skepticism as the ground radar has not reported anything else in the sky. The military officer in charge threatens him over his prank. Even Sally Caldwell (Mara Corday), his girlfriend/mathematician, does not believe him. Major Bergen (Clark Howat) is about to fight him when a call comes in about another sighting of a UFO and a missing commercial plane. Again, nothing else was seen on the radar, and the pilot had called in the sighting. Suddenly, Mitch and Sally are on their way to Washington. 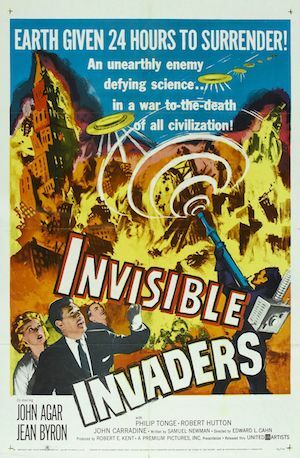 On their flight, the plane is attacked by the UFO and they end up in the area of the U.S./French Canadian border, where they are rescued by Pierre (Louis Merrill). When the authorities arrive, Pierre is outside and screams. He has seen la Carcagne, a French Canadian mythic creature, part woman, part giant bird. In New York, the pair meet up with Generals Considine and Buslirk (Morris Ankrum and last week’s star of The Neanderthal Man, Robert Shayne). Mitch has found a pattern in the bird’s attacks, based on a giant spiral. More attacks are happening and they fit the pattern. 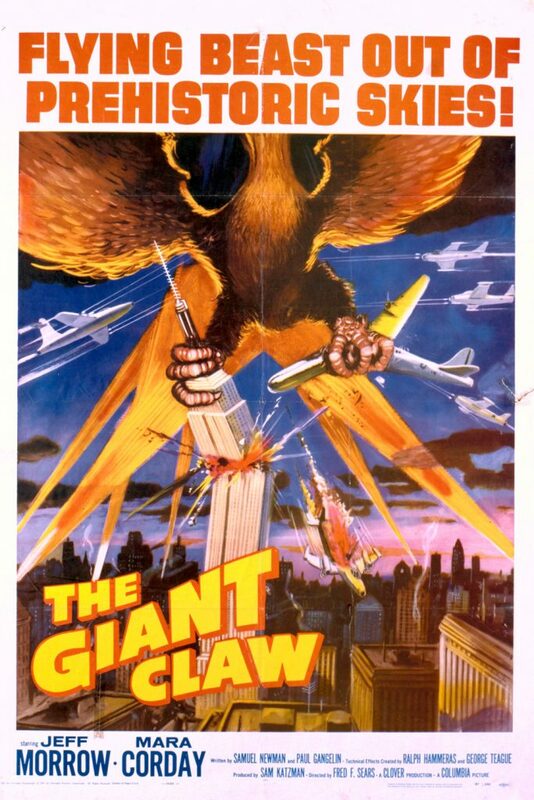 Up to this point, the The Giant Claw is a decent little B film. Then, we get to see the bird. Oh, my Lord! According to IMDB, Jeff Morrow stated that, up until the premier, no one in the cast had seen the creature. 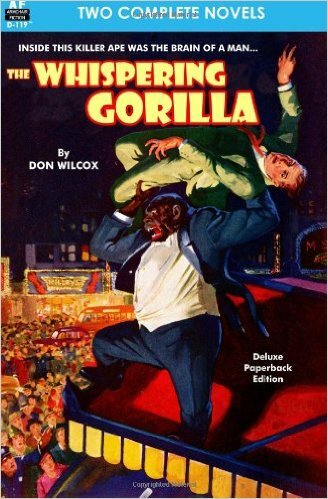 Morrow saw the film in his hometown and when the crowd started laughing, he got up and left, rather than be recognized for being in the film. The producer ran out of money and contracted with a special effects group in Mexico. Their monster is one of the great laughing stocks in B movie history. The giant bird is a puppet with a deformed face. You can see the strings in a few scenes. It is unconvincing and horrid-looking and ruined what might have been a decent film. Humanity wins against this extra-terrestrial being with an anti-matter screen which is bent on destruction. The method doesn’t make a lot of sense to me, but by then, you don’t care. It’s a sad finish to a ruined film that had potential. It had been more than 50 years since I saw The Giant Claw the first time. I had hoped my memories were incorrect or hazy. They were but not in a good way. It will be at least that long before I attempt it again. Unless I have to show it to someone as a lesson. 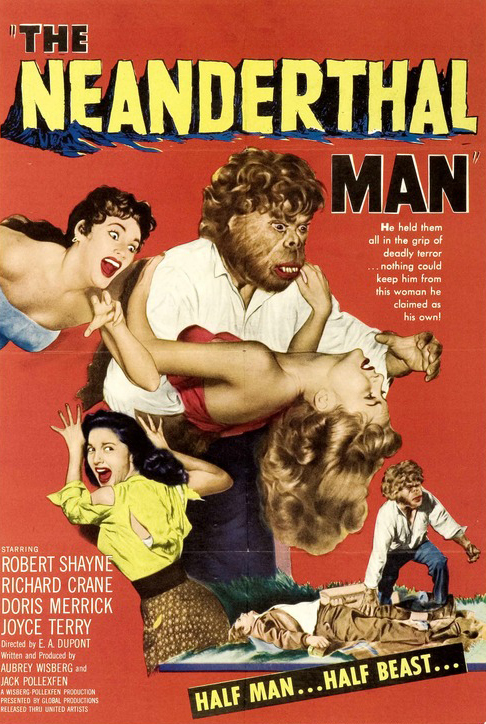 The poster should clue you in that The Neanderthal Man is standard B-movie fare. Sometime over the last year, I DVR’d a bunch of old movies I had never seen. I do this frequently. Sometimes I watch the films, other times I decide that my initial interest has faded and pass them up. 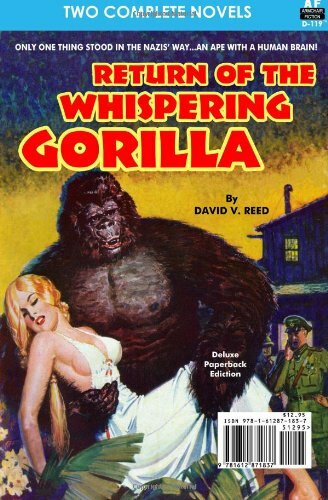 It begins with Professor Clifford Groves (Robert Shayne, mistakenly credited as Robert Shane) living in the mountains of California, where he conducts experiments and formulates theories about Man’s ascent up the evolutionary ladder. He is working at home when he hears a loud noise and a crash. Something has happened in his laboratory. Local hunter Wheeler is out looking for game and he runs across a saber toothed tiger, which he calls a “big cat,” even though it’s three times the size of a mountain lion and has tusks. Even though he is armed, Wheeler elects not to take a shot. Instead he goes down to Webb’s café and tells his story. No one believes him. Nola the waitress (Beverly Garland) is sympathetic but that doesn’t help. The local game warden George Oakes (Robert Long) decides to investigate and finds the spoor of something big. He makes a plaster cast of it. He takes the cast to Dr. Ross Harkness (Richard Crane), the zoologist at the local university. Harkness thinks it is a manufactured piece, rather than something authentic. Professor Groves’ evolutionary chart shows Cro-Magnon man prior to Neanderthal and has the hoaxed Piltdown Man on the list. No wonder the local scientists group at the Naturalist’s Club thinks he is loony. And a mad scientist in the California woods is not to be fooled with. Harkness is aware of some of Groves’ theories, having disputed with them in the past. He has a confrontation with him at Groves’ house when he brings the Professor’s fiancé, Ruth Marshall (Doris Merrick), up from the café where her car has broken down. Harkness is looking for Oakes, who parks his car at the Professor’s house since the roads end there. Groves throws Harkness and Oakes out when he confronts them. The two go out looking for the saber toothed tiger and find it. They kill the beast and go to get Groves so they can have another person verify the kill. They have to wait for Groves to emerge from his lab and when they take him to the spot, the dead body has disappeared. The Professor loses his temper over the wasted time and throws them out again. Ruth notices changes between the man she fell in love with and the current Professor. And, no wonder! The Professor has run out of test subjects other than a small cat which he injects with an experimental fluid. We can now guess where the tiger has come from. With his big cat dead, the Professor does what any sane man would do. He injects the serum into his own body. Within minutes he has grown lots of hair and bad teeth. He runs out into the woods and attacks Nola who is posing for photos with her boyfriend. The boyfriend dies in the scuffle. I don’t think I need to tell you much more of the plot. You know the drill. The Neanderthal Man is standard B picture fare, nothing startling, nothing revelatory. The acting is OK to poor. The special effects budget was somewhere between $5 and $20. The saber toothed tiger looks amazingly like a real tiger (occasionally on a not-unseen leash) though the tusks are only seen in close up shots. In other words, the saber toothed tiger walking looks like a tiger walking without the saber teeth. The Neanderthal make-up looks like it’s from a bad werewolf movie, replete with the time lapse fur-growing scenes. But for 1953 drive-in fare, the movie is palatable. Robert Shayne overacts the mad scientist part quite well and slings erudite insults at his Naturalist Club members with ease. And, Beverly Garland is a young Beverly Garland and well worth the attention. This is not a film to make great effort to see, but if you have 78 minutes with nothing better to do, you could do worse.